Walk to the quaint and lovely town of Blowing Rock which features wonderful restaurants, shopping, a town park/playground, library, etc. 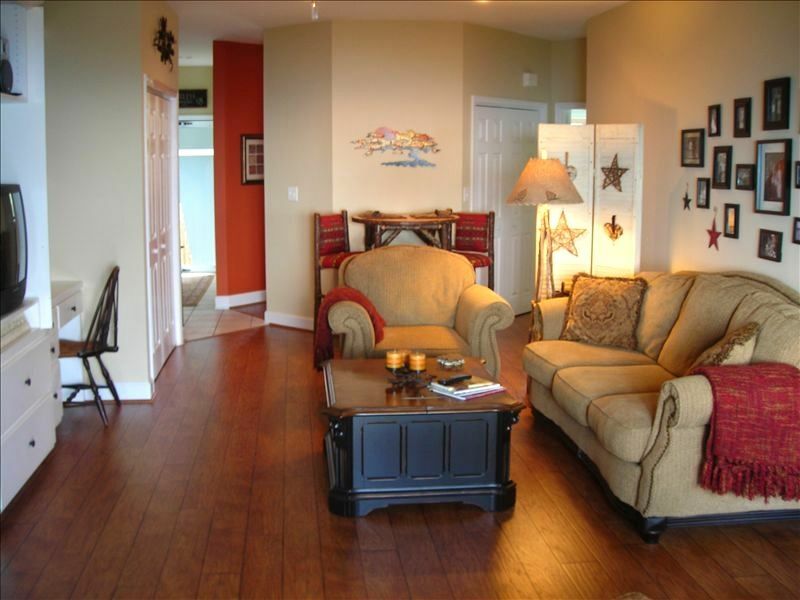 This condo is located in The Hamptons complex which offers breathtaking views of the Johns River Gorge. At 3500 ft, even summer months offer a cooler retreat. This condo features 2 bedrooms, the master has a king size bed, vaulted ceiling w/fan, wall mounted flat screen TV and awesome gorge views. The master bath has tile floors and a shower/tub combo. The second bedroom has a queen size bed, ceiling fan and separate bath with tile floors and a shower. The large family room has a vaulted ceiling only offered in the 2nd floor units, a corner stacked stone gas fireplace, and a cozy deck with beautiful views of the gorge. The kitchen is well stocked and has new stainless steel appliances (December 2014). The interior has been redone with wide plank flooring, new interior paint and upscale furnishings. New carpet in bedrooms (May 2015), secondary bath remodeled (May 2015). The Hamptons complex is located on Main St. in Blowing Rock and offers an enjoyable walk into town with the shops and restaurants being just under a mile from us. The Blue Ridge Parkway is less than 2 miles away. Make sure you visit the Moses Cone Craft Center and Julian Price Memorial Park for some great hiking, boating or just a simple picnic along the stream. Grandfather Mountain and its Mile High Swinging Bridge are also a short drive from Blowing Rock. Tanger Outlet Mall, Appalachian Ski Resort and Tweetsie Railroad are just minutes away. The town of Boone - home to Appalachian State University is approx. 7 miles away and another vast assortment of shops,restaurants and golf courses can be found in their larger commercial district. Plenty of nearby activities to please everyone! Enjoy Incredible views of the Johns River Gorge from the family room, master bedroom and deck of this condo! Well appointed, complete kitchen and a king size bed in the master suite is a bonus. We're already looking ahead to our third consecutive visit in August 2019! Why settle for an ordinary condominium when you can get the BEST!! An open and spacious unit that is well-appointed. Sleeps four comfortably and offers privacy. Located in the quiet and scenic High Country of North Carolina. Beautiful gorge views and an easy walk to historic Blowing Rock. It doesn't get much better than this! The condo was very clean, neat , and very well equipped . It is close enough to Blowing Rock proper to walk to and comes with a very nice view. I would readily stay again. We had an amazing time staying in this condo. The unit is beautifully furnished with everything you could need for a hassle free vacation. The view of the gorge is out of this world. It was so quiet out on the deck, all you could hear were the birds chirping. We loved walking into downtown Blowing Rock everyday (about 3/4 to 1 mile). There is a sidewalk the whole way there with pretty houses and mountain views along the way. We can't wait to go back! My husband and I have stayed at the Shirleys wonderful condo for one month each of the past 5 years. It is a beautifully decorated, spacious and comfortable home with STUNNING mountain views from the balcony. It is very well located—15 minute walk or 3 minute drive into downtown Blowing Rock. We also enjoyed Bass Lake for walking and many great restaurants right here in town. There is something for everyone very close by. The Shirleys have been accommodating in every way. They obviously take great pride in keeping this home in perfect and welcoming condition.